HiTrainer is a Non-Motorized Treadmill designed to improve Acceleration, Power and 4th Quarter Conditioning. 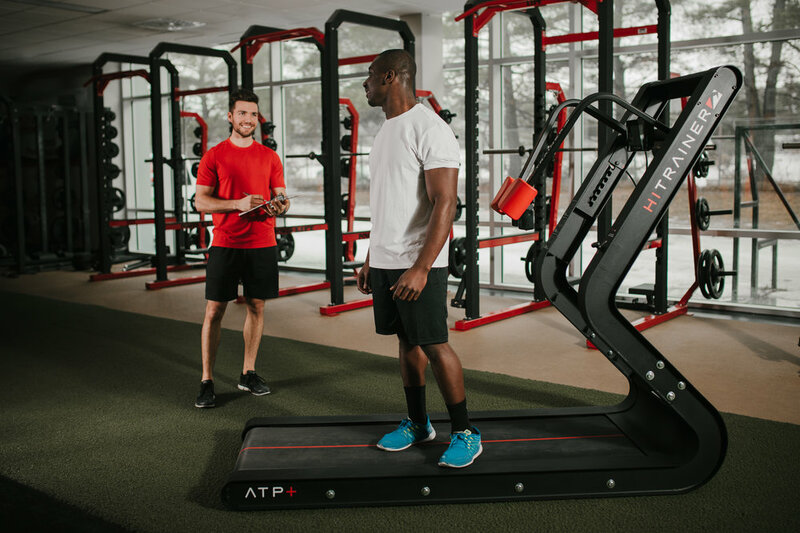 The source of the HiTrainer conditioning power is a result of positioning the user in the patented Drive Position to engage the maximum amount of muscle mass and combine it with interval training on a self-propelled running surface. The immediate data feedback insures good intensity levels and motivation. The HiTrainer peaks your metabolism very efficiently and changes you at the cellular level. The athlete is placed in a lean in, simulating the late Drive Phase, and their chest rests on two pads with Force Sensors. This forward lean reduces joint impact, promotes increased ground force production (propulsion), and recruits the posterior chain in a safe sprint position that protects hamstrings during maximal effort. The most exciting aspect of the HiTrainer that is otherwise difficult to measure efficiently is Time to Peak Power, also known as explosiveness. Powerful athletes are always explosive and everyone from Olympic lifters to top sprinters chase this quality. Being able to measure how long it takes, in seconds, is the first step to making progress.